With the big game coming up, flowers might be the last thing on your mind. But whether you’re going to someone else’s party or hosting your own, adding some flowers to your party decor can be a great way to show team spirit! Here are some ways you can use flowers at your superbowl party. 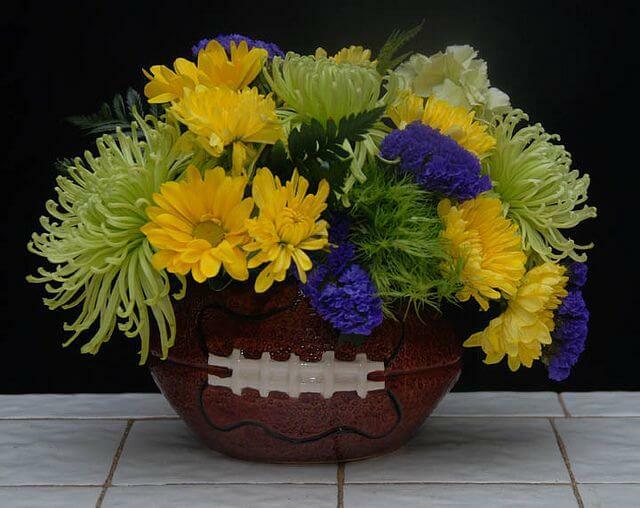 One of the easiest ways to use flowers at your superbowl party is to get an arrangement with your team’s colors! Rooting for the Cowboys? A blue and white arrangement will let you show your pride. More of a Rams fan? Try some blue and yellow tulips. Or maybe neither team is your first pick, so you get two arrangements, one for each team. If you’re still feeling down about that Seahawks loss, you could do a small bouquet of blue-green orchids. Flower choices for this are endless, since you just need the right color. Some popular flowers you could use are amaryllis, roses, tulips, and carnations. It’s easy to find these is several different colors, which gives you lots of good options for your arrangement. For team colors that are harder to find – for example, black or green, think about how you can accessorize the arrangement. For example, if a team’s colors are green and white, use some heather as a green filler. If your team’s colors are black and orange, choose some begonias or chrysanthemums and tie a black ribbon around the vase. Maybe you don’t want to take sides so fast (we’ll ask you again at halftime). If so, choose a neutral arrangement with a football theme. 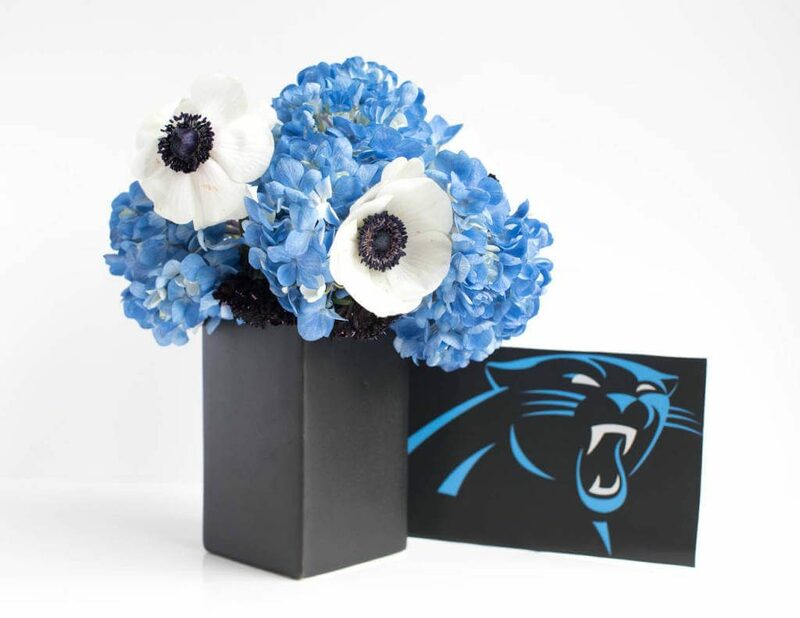 This could include adding small football accessories in the bouquet. Some florists will even do this for you. Centerpiece sticks of helmets, jerseys, and footballs are great for this. If you have a small team flag, add that too! Got an old football laying around? Cut open both ends of the football and remove the rubber liner from inside Take an appropriately sized glass vase and put it inside the football. Add your flowers and you’ve got some easy team spirit! You could decorate an old football helmet, too, by dressing it up with some flowers of your favorite team’s color. This makes a great centerpiece. Yellows of all shades are in this year, which is great since yellow is a classic flower color. In fashion, you can expect to see pops of yellow to make a look stand out as well as bold pieces, like coats and jackets. Many people think of sunflowers when they think about yellow flowers. Sunflowers can really brighten up your home on those dark, wintery days. Daffodils, tulips, or yellow roses are another popular choice. And if this bold color doesn’t match your home very well, don’t worry. You could use goldenrods or yellow baby’s breath for filler, and then do a different color for the main attraction. And you don’t have to go bright and bold if you don’t want to – there are many flowers that have a softer yellow color. For example, you can find carnations and gerbera daisies that come in lighter yellow. Who says flowers have to just be centerpieces? 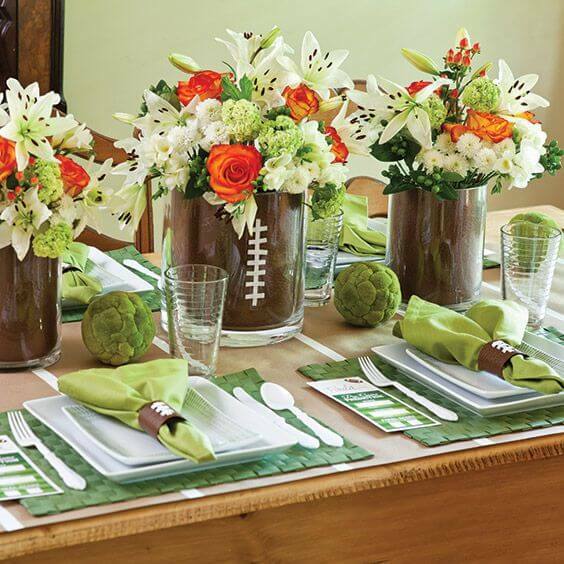 Turn it into a game by having guests bring a few flowers to represent their team’s colors, and put them in a vase. Have each person guess what the score will be, and whoever is closest gets to take home the bouquet. Have fun with it! If you’re attending a party this year, bring your host some flowers to thank them for hosting. Choose the colors of their team for extra points. If you know the host’s favorite type of flower, you can’t go wrong choosing an arrangement that includes those. If you’ve hosted a party before, you know how much work it can be, so your gesture will be truly appreciated. There are many ways you can decorate your party space. For example, you could put each team’s flowers on different sides of the snack table. You could even split up the room using the flowers, with one team’s fans on one side, and one on the other. Setting the flowers near the TV is good, since that’s where the focus will be – but you won’t want to block anyone’s view, so make sure you check your placement from a few different angles. Now, you’re ready to have a great superbowl party. Even if your favorite team doesn’t win, you’ll still have a lot of fun getting into the spirit of the game.